Can I order after the deadline? My proof is too light or too dark. Can you fix it? Can you remove someone or something from my picture? Do I have to pay shipping and handling for both orders? Can packages be split between different proofs? What type of folders do you offer? What do your special graduation products look like? What if I don't like the photos or other products? My credit card will not go through due to an "AVS Mismatch", how can I fix this? My question is not listed here... How do I reach you guys? Please note however, placing your order by the deadline date will guarantee all prices and ensure fastest delivery. Orders received after the deadline date are subject to the $5.00 late fee noted on the very bottom of your order form. The proof on your order form has not been color corrected; however, your finished pictures will be lightened or darkened as necessary. Don't worry... we'll make it look great! 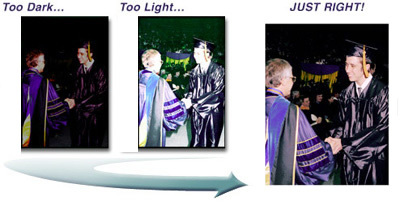 We try to take each graduate's photo just as he or she is receiving their diploma. That's approximately one picture every 2 to 3 seconds. Due to the "Candid" nature of our pictures, we are unable to custom crop at the time the photograph is taken. If you wish to have us change the photograph in any way, extensive retouching is available. Call our office during normal customer service hours and we'd be happy to give you an estimate for any custom work you may require. No. Simply combine your total order and calculate your shipping using the shipping chart on your order form. 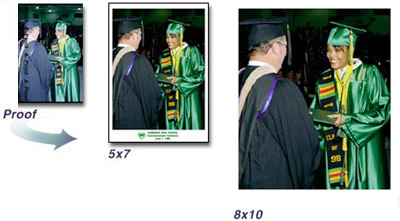 Products such as plaques, Tassel Frame and panoramics are shipped separately. As a result, your separate products may be shipped several days apart. If you do not receive your products within the next 14 days, please call our Customer Service Department at 1-800-482-0321 between 9:00 a.m. - 5:00 p.m. EST, Monday - Friday. Don't panic . . . . it's on the way! Lamination is a clear plastic coating which helps protect and enhance the quality of your photos. Lamination significantly reduces fading and yellowing from exposure to light. Lamination will also protect your photos from water damage. Its definitely the way to go for a great look. See our Products page for more lamination details. Our packages are designed to be your best value. Packages must be ordered from the same proof and not split between proofs. Our folders are made of quality black linen. The inside cover is embossed with a rich gold foil inset. Folders offer a terrific presentation for gift photos. See our Products page for more folder details. The proof we sent you shows 100% of the image. Different print sizes have different proportions. As an example: a 5x7 photograph is longer and narrower than an 8x10 picture. To help you understand what your final photographs will look like, please note the standard "cropping" we automatically use in the printing process. Please take a look at your proofs. Part of each proof will be cropped out (removed) from your finished prints. Packages and individual pictures are mailed separately in 2-3 weeks. Plaques, frames, and any other special products are shipped in 4-6 weeks. Each of our graduation products is shown on the color brochure which was enclosed in with your order form. Also see our Products page for examples. Simply return the product with an explanation as to why you are not satisfied. You will receive a refund within 3 weeks of your return. You'll need to call our office during regular office hours toll free at 1.800.482.0321. Our customer service representative will provide all of the necessary information for you to place your order either by mail or on the web (log in by clicking 'Graduate Login' at the top of the page). All proofs are mailed to the graduate's home within 3-4 days of the graduation ceremony. Your proof may have been lost in transit, but you can still order. We apologize for any inconvenience this may cause. You may place your order by telephone. Call us Monday - Friday, between the hours of 9:00 am and 5:00 pm (EST). Our credit card processor uses a billing zip code to verify the credit card. If the zip code does not match the billing address returned by the bank OR if the postal code is not in the same format as the US, the card will not go through. We can process the card in our office, over the phone. Please call Customer Service at 800-482-0321. Our customer service representatives are available TOLL FREE at 1-800-482-0321 to take your call from 9:00 a.m. to 5:00 p.m. EST - Monday through Friday. If you do not call during regular business hours, call our voice mail service at the same number and we'll call you back during the next business day.